by Jim A. Cornwell, Copyright © 1995, all rights reserved "Lascaux Cave Paintings and Location - Genesis Day Three 17,490 B.C." This page was added on 5/25/98 and consist of contents from various other sites regarding this subject. The following information can be found at "http://www-sor.inria.fr/~pierre/LaSCoW/lascaux.html"
Lascaux may be the most beautiful Paleolithic painted cave in the world. It contains more than 1500 pictures of animals, all of them are 17,000 years old. "http://www-sor.inria.fr/SOR/projects/LaSCoW/images/" as "202.gif" and "204.gif"
From "The Cave of Lascaux -- The Final Photographic Record"
Editor's Note: In ancient caves in the south of France, near Lascaux, boys in 1940 discovered 17,000 year old paintings and artifacts made by our early ancestors. "Dating back some 17,000 years, the cave was evidently a sanctuary for the performance of sacred rites and ceremonies." The book The Cave of Lascaux- The Final Photographic Record by Mario Ruspoli extensively examines these treasures of earliest known paintings and the art. I recommend its purchase for anyone serious about hunting. "Although he has been called an opportunistic omnivore," man is primarily a hunter. For over two million years one of his principal activities has been to use his cunning and group strategy to capture and kill the animals around him - from the smallest to the largest, the weakest to the most ferocious. The hunting of big game began with Homo Erectus I, 600,000 years ago and gradually replaced the hunting of smaller game which his predecessors had pursued. To attack and vanquish a beast much larger than himself and equipped with considerable defenses (teeth, claws, hooves, horns or antlers) he had to invent strategies or draw inspiration from other predators, such as lions, wolves or wild dogs. The hunting of big game provided new experiences for Homo Erectus, bringing about an intensification of the learning process for the young and a considerable increase in the area and distances covered by expeditions. The application of the group tactics and strategies needed to approach and catch big game developed the powers of observation, agility, cunning, memory and knowledge of the habits of each animal species and probably also helped in the development of communication and language. "The habit of meat-eating led by imperceptible degrees to more complicated hunting techniques and gradually transformed mankind. For the first time culture and tradition became increasingly responsible for changes formerly brought about only by genetic mutation and natural selection." (J Pfeiller). As in present-day tribes, the social structure of a group of hunters was restricted to twenty or thirty individuals, although they might regroup on a temporary basis to form associations with other tribes for more important hunts. Was Homo Erectus already setting traps, digging pits to capture elephants and rhinoceros? There are some indications to support this hypothesis, such as the age of the animals killed and the discovery of large spears in the deposits. We also have evidence of ambushes laid by Homo Erectus at Olduvai, and at Torralba and Ambrona (Spain). The forces of natural selection were intense during the last period of glaciation about 100,000 years ago, and evolution favoured the survival of groups or individuals who were endowed with a longer and more extensive memory than average. Thus the development of hunting techniques led to a widening of the gap between 'primitive people', with their considerably enlarged cerebral hemispheres, and the rest of the animal world. The process of humanization continued from the early Homo Erectus to the first Homo sapiens who inherited his predecessor's skills and knowledge and like him lived by hunting and fishing, but made great advances in his industries and techniques. The Cave of Lascaux- The Final Photographic Record by Mario Ruspoli, Page 66-67. First published in Great Britain in 1987. Copyright �86 Bordas,S.A. Paris. English translation Copyright �87 Thames & Hudson Ltd., London. All original material: Copyright �95, 1996 hunternet. All rights reserved. Paleolithic European Constellations - star maps in Lascaux cave in France 16,500-13,000 B.C. The following are highlights from the above author and website mentioned and represents Ancient Star Maps in caves in France and Spain. As reported on http://news.bbc.co.uk/2/hi/science/nature/871930.stm - Wednesday, 9 August 2000, 01:00 GMT 02:00 UK "Ice Age star map discovered" by BBC News Online science editor Dr. David Whitehouse a prehistoric map of the night sky has been discovered on the walls of the famous painted caves at Lascaux in central France, known as the Shaft of the Dead Man. The map, which is thought to date back 16,500 years, shows three bright stars known today as the Summer Triangle. Also claimed is that a map of the Pleiades star cluster has also been found among the Lascaux frescoes and also another pattern of stars, drawn 14,000 years ago, has been identified in a cave in Spain. This is all according to German researcher Dr. Michael Rappenglueck, of the University of Munich; who claims the maps and drawings show that our ancestors were more sophisticated than many believe, and the star map gives insight into our distant ancestors' minds, by showing their artistic talents and scientific knowledge as well. The Lascaux caves discovered in 1940 A.D., with their spectacular drawings of bulls, horses and antelope, were painted 16,500 years ago and this article suggests it is a prehistoric planetarium in which humanity first charted the stars, and painted on to the wall of the shaft is a bull, a strange bird-man and a mysterious bird on a stick. According to Dr. Rappenglueck, these outlines form a map of the sky with the eyes of the bull, birdman and bird representing the three prominent stars Vega, Deneb and Altair, popularly known as the Summer Triangle, and seen during the middle months of the northern summer. Around 17,000 years ago, this region of sky would never have set below the horizon and would have been especially prominent at the start of spring. "It is a map of the prehistoric cosmos," Dr. Rappenglueck told BBC News Online. "It was their sky, full of animals and spirit guides." This sky map is not the only evidence that prehistoric man took a keen interest in the night sky. Nearer to the entrance of the Lascaux cave complex is a magnificent painting of a bull. Hanging over its shoulder is what appears to be a map of the Pleiades, the cluster of stars sometimes called the Seven Sisters. Inside the bull painting, there are also indications of spots that may be a representation of other stars found in that region of sky. Today, this region forms part of the constellation of Taurus the bull, showing that mankind's identification of this part of the sky stretches back thousands of years. Dr. Rappenglueck has also identified a star map painted on the walls of a cave in Spain 14,000 years ago at Cueva di El Castillo cave, in the mountains of Pico del Castillo, and contains a region called the Frieze of Hands. At the end of this remarkable section can be found a curved pattern of dots. "Nobody paid much attention to it," said Dr. Rappenglueck. "But, it is obviously a drawing of the constellation we call the Northern Crown. It is remarkable." The archaeologists who have looked at Dr. Rappengleuck's conclusions have so far agreed that they are reasonable and that he may have uncovered the earliest evidence of humanity's interest in the stars. Continued from Gary D. Thompson website at http://members.optusnet.com.au/~gtosiris/page11-1.html. A Great Bull painted image (#18 (fourth bull), main hall, right wall) in the "Hall of Bulls" in the Lascaux cave in France. Upper Paleolithic cave art was first discovered in 1856 in the cave of Niaux in France. Paleolithic cave art remained largely ignored, even suspected by some as a hoax because of its sophistication, until the first decade of the 20th-century. The discovery of the Altimara cave in northern Spain (discovered in 1879 and only fully explored in the 1950s) initiated 15 years of controversy before the acceptance of the cave paintings as Paleolithic art. Other Paleolithic cave art locations are Chauvet (near Marseilles discovered in 1994), and the (now) underwater cave Cosquer (also near Marseilles discovered in 1991). The Lascaux cave contains some 600 paintings and 1500 engravings dating from the Paleolithic Period. The very few symbols are limited to isolated or grouped dots (mostly black) and to variously coloured dashes. The animals depicted on the cave wall are horses, bulls, and deer. The "Hall of Bulls" mural is dated circa 15,000 B.C. The radiocarbon dating of charcoal recovered from the cave floor indicates occupancy circa 15,000 B.C. to 14,000 B.C. Lascaux's Hall of Bulls is approximately 18.5 metres long, 7 metres wide, and 6.5 metres high. The largest painted bulls are approximately 6 metres long. Several researchers have offered an astronomical interpretation of Great Bull #18. The bulls are actually aurochs, a large species of wild cattle. There are 2 sets of painted dots closely associated with this bull. One set of dots is placed above the shoulder of the bull and the other set of V-shaped dots are located on the bull's face. Also, there is a row of 4 painted dots to the left of this bull. The Spanish researcher Luz Antequera Congregado in her doctoral thesis "Arte y astronomia: evoluci髇 de los dibujos de las constelaciones" (1992) first set out the astronomical interpretation that the dots above the shoulder of the bull depict the Pleiades open star cluster and the dots on the bull's face depict the Hyades open star cluster. In her later paper "Altamira: Astronom韆 y religi髇 en el Paleolitico" (1994) she interpreted the row of 4 dots to the left of Great Bull #18 as the stars of the belt of the constellation Orion. Luz Antequera Congregado has also investigated Paleolithic art in other European caves from an astronomical perspective. See her essay: "Practicas Astronomicas en la Prehistoria de la Peninsula Iberica y los Archichipielagos Balear y Canario" (1994). Wheston Price also made the identification of 10 painted dots on a Neanderthal cave painting with the Pleiades. 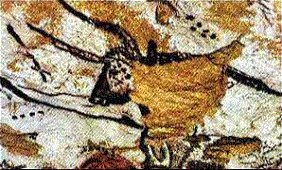 Some people believe that the #18 Lascaux auroch with the two associated sets of dots represents the constellation Taurus. This idea was firmly set out by the American astronomer Frank Edge in his 35-page booklet "Aurochs in the Sky" (1995) and later article "Taurus in Lascaux" (1997) from studies in this area in 1991. Frank Edge holds that at least one of the Great Bull images (#18) in the "Hall of Bulls" in the Lascaux cave can be identified as celestial by the simple comparison of the associated dot markings with two particular star groupings as they were viewed on the horizon circa 15,000 B.C. Specifically that a group of 6 dots painted above the shoulder of auroch #18 represents the Pleiades open star cluster, and that another group of V-shaped dots painted on the auroch's face represents the Hyades open star cluster. The German scholar Michael Rappenglüeck, University of Munich, believes the art of the Lascaux cave not only involves the depiction of constellations but is also a cosmographic depiction by Paleolithic shamans. His idea that the Pleiades were depicted in the Lascaux cave were first presented at an astronomy conference in 1996 and later published in his essay "The Pleiades in the 'Salle des Taureaux' Grotte des Lascaux" (1997). He has worked on the subject of "Paleoscience" since 1984. His ideas that the Lascaux cave paintings depict shamanistic cosmography were first set out in his doctoral thesis "Eine Himmelskarte aus der Eiszeit?" (1998). Michael Rappenglüeck has also investigated Paleolithic art in other European caves from an astronomical perspective i.e., the Cueva di El Castillo in Spain. The art in this cave is dated circa 12,000 B.C. Interestingly, during the first decades of the 20th-century the French prehistorians Marcel Baudouin and Henri Breuil speculated about the possibility of constellations being represented in prehistoric art. During the last decades of the 20th-century they were followed by the Swiss engineer Amandus Weiss, the astronomer Heino Eelsalu, and the German art historian Marie König who considered the possibility of constellation representation in the Lascaux cave art. However, the main proponents remain Luz Antequera Congregado, Frank Edge, and Michael Rappenglüeck. All were involved in independent and lengthy research prior to their first publications. Luz Antequera Congregado largely bases her ideas on the application of the art-historical approach and does not employ archaeological or astronomical analysis. Frank Edge also utilizes art-historical and psychological approaches as well as simple constellation projections onto particular paintings. Michael Rappenglück applies a wider interdisciplinary methodology. To date none of the arguments attempting to show the existence of some sort of Paleolithic astronomy can be considered convincing. Many researchers have believed that the animals painted by the Ice-age hunter-gatherers at Lascaux (the Magdalenian culture) were simply those that they hunted. Certainly the animals they depicted comprise the most dangerous in the world of the Ice-age hunters and were both prey and food. The painted dots are thought by some persons to be perhaps no more than a tally of hunting kills. However, the concepts of hunting magic and hunting tallies would seem to be wrong. The hunted animal remains on the cave floor were largely reindeer yet reindeer are entirely unrepresented in the cave art. Some recent investigations suggest that beliefs involving connection to the spirit-world, through trance and hallucination, are perhaps the key to understanding the cave paintings (including the dot patterns). See especially the remarkable book The Mind in the Cave by David Lewis-Williams (2002).) Professor R. Dale Guthrie, Emeritus Professor in the Institute of Arctic Biology at the University of Alaska, Fairbanks; and author of The Nature of Paleolithic Art, proposed in 2006 that the art was largely produced by adolescent males and is somewhat akin to modern teen graffiti. Sumerian alim: wild ram; bison; aurochs; powerful. Sumerian s鷑: aurochs cow; beerwort. Sumerian 醡a, am: wild ox or cow (aurochs). Arabic rim is a two-horned animal. Aurochs, also urus and wisent, are obsolete German, variant of German Auerochs, from Middle High German urohse, from Old High German urohso: uro, aurochs + ohso, ox. Urus is an extinct wild ox (Bos primigenius) of Europe, northern Africa, and western Asia, believed to be the ancestor of domestic cattle [Latin urus, of Germanic origin]. Wisent is the European bison (Bison bonasus) having a smaller and higher head than the North American bison [German, from Middle High German, from Old High German wisunt].